Steve is a trial and appellate lawyer who concentrates his practice in the area of federal patent litigation. In addition, his litigation experience extends to protecting other key drivers of business success, including trademarks, trade secrets, cyber security and confidential information. Steve further relies on his background as an Assistant U.S. Attorney to practice in the area of white collar criminal defense, responding to government inquiries and conducting internal investigations. In patent litigation throughout the U.S., Steve draws on his deep writing and trial experience to investigate facts and identify credible witnesses, develop offensive and defensive strategies for achieving the desired outcome, and reduce diverse, complex technologies to fit the varied expertise and time limitations ever present in federal court. A large part of Steve’s success is the result of working closely with clients to understand their technologies, products and brands as well as they do, and to efficiently convey the facts and law to judges and juries. Given the high costs of patent litigation and any federal court litigation, Steve actively seeks early and efficient disposition of a client’s dispute. When a case has to be tried and a client’s market share is on the line, Steve has the experience and the record to be the trial lawyer of choice. As lead counsel, Steve has tried more than 40 complex federal jury trials to verdict and briefed and argued more than 35 federal appeals including one en banc argument in the Eighth Circuit. In 2014, he was a member of the team that briefed and won the Octane Fitness patent fees case in the U.S. Supreme Court. Remarkably, Steve has a perfect record of success in trial and on appeal. While Steve represents both patentees as well as accused infringers, to date not one of his accused infringer clients has paid a dime to a patentee. Several patent cases have involved electronics, IOT products, software and computer control of industrial processes. In one significant case, the asserted patents were found invalid prior to discovery. In one case, a settlement was reached in which Steve’s client ended up owning the plaintiff and its asserted patents. Steve’s deep experience in all federal crimes and with numerous U.S. Attorney’s offices and the U.S. Department of Justice also make him an excellent choice for criminal representation. None of his criminal defense clients has been charged with a crime. As a prosecutor, his experience included large domestic and international white collar fraud, tax, federal capital murder and public corruption offenses. As a Supervisor in the U.S. Attorney’s Office, Steve oversaw a White Collar Crime Unit, an Environmental Crimes Task Force, an Anti-Terrorism Task Force and a Cybercrimes Unit. For many years, he was one of the lead federal capital prosecutors in the U.S., performed in that role in several federal districts, served on the Attorney General’s Capital Crimes Review Committee and Working Group and co-authored capital jury instructions in the Eighth Circuit. 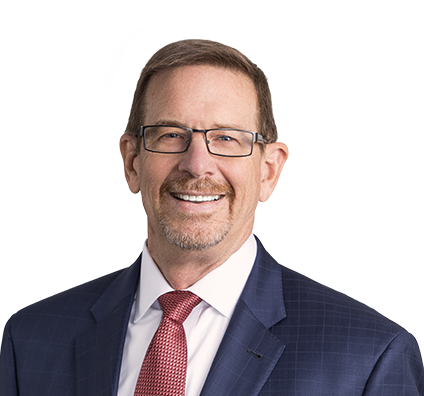 Steve continues his public service as a member of two committees for the U.S. District Court for the Eastern District of Missouri and co-teaches “Intellectual Property Litigation” as an Adjunct Professor at Washington University School of Law. Lead counsel representing Fortune 500 company that received third-party subpoena in memory chip patent infringement case. Following investigation and conferences with subpoenaing party, successfully obtained drastic limits on document production, agreement to accept unsworn interview in lieu of deposition and covenant not to sue on patents in suit. (In re Recipient of Third-party subpoena). Represented patentee asserting infringement of patents covering use of nitrogen in smoke machines used to detect auto emission control system leaks. Engaged shortly before trial to replace prior counsel, argued summary judgment motions, won sanctions order against defendant and obtained fee award. Despite prior extensive representation, plaintiff’s case was weak and plaintiff was exposed to more liability than it could successfully recover. After protracted negotiations, global settlement of all claims were reached that ended the dispute and plaintiff’s exposure. Successfully represented former federal IT sub-contractor investigated for theft of trade secrets in Southern District of Illinois. Client not charged with offense. Represented individual being investigated for role in shipment of adulterated dog food, a strict liability FDA offense, between supplier and co-manufacturers of dog food for approximately 9 months until termination of representation due to conflict. Member of trial team and lead appellate counsel in two capital jury trials of bank robbers who murdered security guard during bank robbery. (U.S. v. Allen and Holder, 247 F.3d 741 (8th Cir. 2001) (Allen I)) Both sentenced to death. Lead counsel in successful 8th Circuit en banc appeal of panel reversal. Convinced 8th Circuit en banc, including original panel, to affirm convictions. Established that omission of essential element in grand jury indictment was not structural error and therefore subject to harmless error review. (U.S. v. Allen, 406 F.3d 940 (8th Cir. en banc 2005) (Allen III)). Thereafter served as lead trial counsel in approximately 8 weeks of civil post-conviction review hearings. See, Holder v. U.S., 2008 WL 2909648 (E.D.Mo. 2008), aff’d, 721 F.3d 979 (8th Cir. 2013); and Allen v. U.S., 2011 WL 1770929 (E.D.Mo. 2011). In Allen, served as lead counsel in 6-week hearing on claims. District Court entered 278-page Memorandum and Order denying all post-conviction attacks. Allen v. U.S., 2014 WL 2882495 (E.D.Mo. 2014). The Court credited Steve’s cross-examination with demonstrating “the importance of cross-examination in exposing incredible testimony.” 2014 WL 2882495 *109. Lead counsel for attorney who was subject of meritless Motion for Sanctions. Entered appearance several months after motion filed and after extensive briefing. Based on independent factual investigation and negotiation with opposing counsel, Movant dismissed motion with prejudice and without further briefing, preparation or contested hearing. Efforts also lead to subsequent dismissal of motion as to two other attorneys. Selected as Examiner by U.S. Bankruptcy Court in E.D. of Missouri to investigation disposition of assets by debtor in Vietnam. Partial investigation conducted and bankruptcy petition dismissed by Court. In pro bono representation, advised team that secured dismissal of charges against auto dealer charged with failing to pay sales tax on vehicles bought at out-of-state auctions. December, 2015 Amendments to FRCP: Game Changer or Much Ado About Nothing, Federal Practice Fundamentals, U.S. District Court, E.D.Mo.